This prairie planting created by volunteer steward, Bernie Buchholz and friends, is very diverse with over 165 species of plants showing up after several years from 175 species planted. 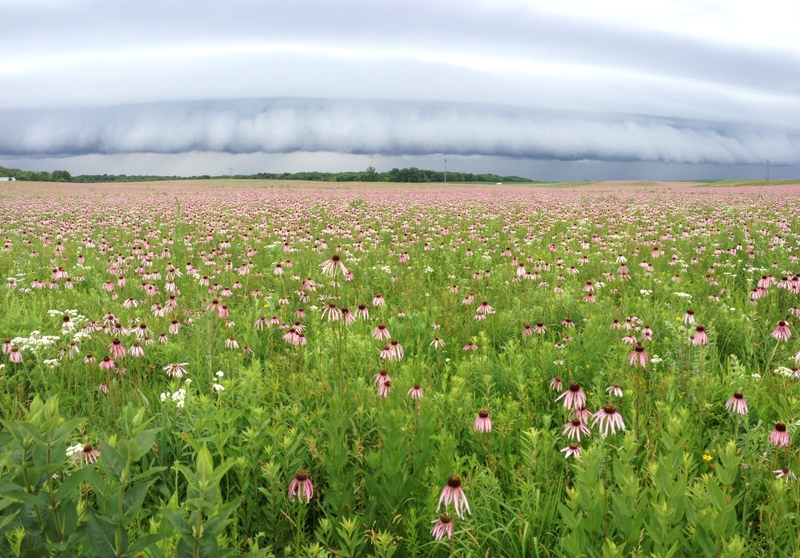 Yes, there is an eye popping amount of pale purple coneflower and a storm front to capture the drama. Over the next several posts I will share lessons learned on prairie restoration. The first lessons is to decide whether you want high or low diversity results. High diversity takes extra time and resources to produce. If your habitat restoration goal is short term like with a Conservation Reserve Program ten year contract, then simply plant some grasses and maybe a few forbs. If you want habitat for birds then you may not need a plethora of plant species. But, if you want to mimic the diversity of remnant prairie on the assumption that good things will result, or to provide habitat for all sorts of insects, or you want to connect remnant prairies with restored prairies in between….then you are talking about high diversity, and my lessons learned are for you. 2 Responses to Lesson learned: Decide whether your prairie planting will be low or high diversity. Yep, that’s a big/good lesson to start with. I might add that in addition to the reasons you listed for wanting high diversity, people need to be sure they’re committed to maintaining that diversity over time before spending the money to plant it. Keep the posts coming! Plus high diversity can be ore resilient to changes in weather or other factors. Some plants thrive or at least complete better in drier years, others in wetter years.